I seriously can't come up with interesting names for recipes. We tried this one tonight and it was unanimously voted "Good!" 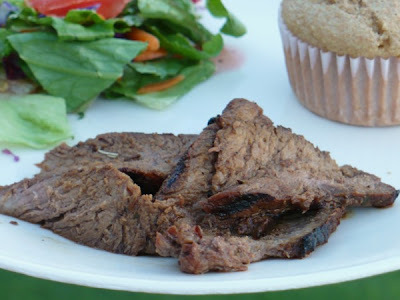 I used a London Broil again and treated it the same as in this recipe. MARINADE FOR BEEF ON THE GRILL aka "Pathetic Name for Yummy Recipe"
Combine all ingredients in a gallon-size Ziploc bag and marinate in fridge for at least 4 hours. Preheat grill to high heat. Remove steak from fridge and bring to room temperature. Grill for 1-2 minutes and turn steak. Reduce heat to medium and cook until desired doneness, turning once. Remove to platter. Cover with foil and let rest 10 minutes. Slice thinly and against the grain.